The County's appeal of the remand was denied by the First District Appellate Court. Absent a further appeal, the Supervisors will have to reconsider the new evidence of the fire in their approval of the Mountain Peak project. A hearing in Napa Superior Court to set the scope of the remand will be held on May 7, 2019. On Aug 22, 2017 the Napa County Board of Supervisors approved the use permit for the 14,575-visitor/year Mountain Peak Winery 6 miles up the dead-end Soda Canyon Road. "Neighbors’ opinion that winery visitors will cause traffic congestion during a fire is not supported by fact." "In the event of a fire that results in mass evacuations from this area, the road has sufficient capacity and roadway width to accommodate all outgoing traffic while allowing incoming fire response units." "Appellant’s claim that fire rescue/response efforts will be impeded along Soda Canyon Road if the Project is constructed are unfounded and not supported by factual evidence." 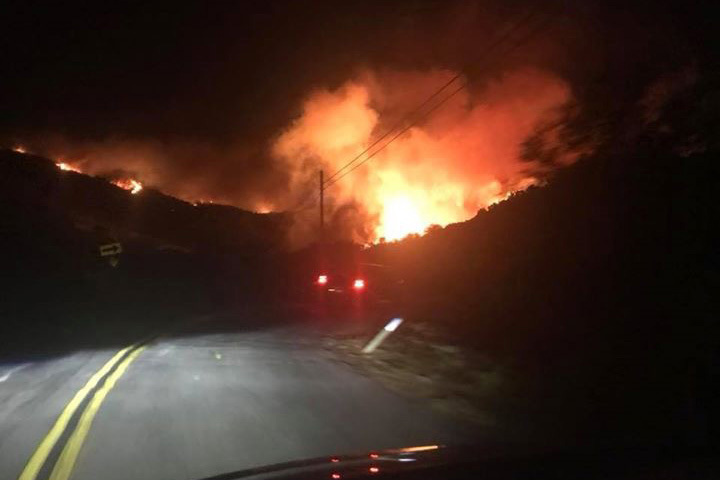 In fact, supporting factual evidence arrived six weeks later on the night of October 8th, as the Atlas fire erupted in fierce winds and quickly engulfed lower Soda Canyon Road. A fallen tree blocked traffic coming down the road and fire trucks coming up as the fire burned on all sides. Frantic effort cleared the road just enough to let the line of cars get by. Dozens of residents, unable to make it down through the fire, had to be evacuated by helicopter from the top of the road. 134 of the 163 residences on Soda Canyon Road were damaged or destroyed, 118 of them a complete loss. Tragically two lives were lost. One year later, in BOS meetings to discuss the issues of remote wineries, Supervisor Diane Dillon questioned the use of winery visitation on the valley floor to evaluate that in remote areas of the county. She called out the approval of Mountain Peak's visitation numbers based on comparable 100,000 gal/yr wineries in highly accessible locations. At one meeting, Sup. Dillon recognized that "we would have had a disaster if there would have been a major event happening of any kind..." at Mountain Peak during the fire. She was referring, no doubt, to a human disaster, but I'm sure it would be seen as a political disaster as well. Sup. Dillon was away during the Mountain Peak appeal, but her Planning Commission appointee, Anne Cottrell, had been the only commissioner to vote against approving the project - on the basis of its access constraints. Soda Canyon residents presented ample first-hand experience and data-based assessments of fire danger on Soda Canyon Road at Planning Commission and BOS appeal hearings for Mountain Peak (beginning at slide 117 here). The Supervisors dismissed the presentation in their findings. Following the fire, residents petitioned Napa Superior Court to include the relevant new substantial evidence it offered as part of their CEQA case against the Supervisor's approval. The Court agreed and ordered that the project be remanded to the Supervisors, noting that the possibility of "the complete inaccessibility of Soda Canyon Road during a fire and resulting helicopter evacuations of stranded individuals" had not been considered by the Supervisors in approving the project. It was "truly new evidence of emergent facts." There has been a lot of posturing lately in government meetings about the need for evidence-based decision-making. Unfortunately, rather than confronting an approval based on incorrect findings backed by little evidence, the Supervisors are challenging the court order to ensure that substantial, factual evidence of the danger of a fire in Soda Canyon will not require them to reconsider their decision. And there are reasons, aside from fire danger, why event venues in general don't belong in the hillside areas of the county: their presence damages the quality of life of residents who treasure the quiet enjoyment of a rural place; their disruptive potential engenders animosity between residents and the wine industry, fueling many battles in recent years; building projects and the commercialization of rural areas hasten the urbanization of the county that will diminish farming as a viable activity, as it has throughout history; and a mass tourism business model that transports large numbers of people to the remote areas of the county each day, and attracts large numbers of tourists to the county each year, will only add to greenhouse gases in an age of global warming. But obviously the potential loss of life when concentrating visitors in fire prone areas, in an age when raging wildfires have become all too common, should be a significant concern to Supervisors as they make their decision to sanction these venues. The remand is an opportunity to reconsider the substantial evidence of that danger for Mountain Peak and for other venues in the watersheds. It is unfortunate that the Supervisors wish to ignore it.